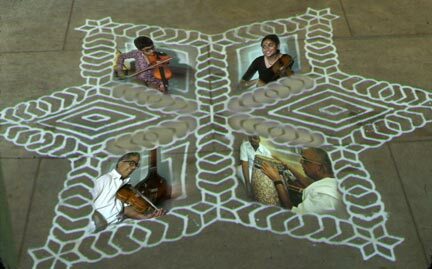 Madras is one of the most musical cities in the world, where thousands of concerts of South Indian classical music every year. Most Madras musicians begin their training in the nurturing environment of the home. In this series, several top musicians are seen in family settings as they teach their children and students, discuss their views of Karnatak music and its spiritual dimensions, and demonstrate elements of this unique devotional classical tradition. VOLUME I follows a day in the life of world-famous violinist T.N. Krishnan, beginning in the private space of his home where he teaches his two remarkable children, Viji, age 14, and Sriram, age 8, both now acclaimed violinists. He then delivers an elegant and charming demonstration of Ragam-Tanam-Pallavi, and guides us through his photo album. After interviews with Viji and Sriram, we enter public space to take a drive through the sights of Madras with TNK’s narration. We then arrive at Shastri Hall, where he performs a public concert, with his daughter Viji and the century’s greatest mrdangam drummer, the legendary Palghat Mani Iyer (1915-1981). 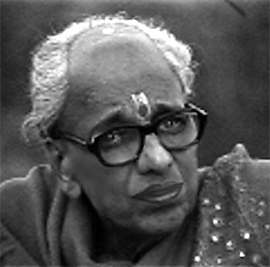 Manjapara Devesa Ramanathan (1923-1984), the disciple of “Tiger” Varadachariar, was a gifted vocalist and composer remembered for his uniquely creative, sensitive, and unpredictable style. “MDR” was awarded the Padma Sri by the Government of India in 1974 and the Sangit Natak Akademi Award in 1975. VOLUME IV Manjapara Devesa Ramanathan appears in rare video footage recorded by Fredric Lieberman and Amy Catlin in 1977. He presents with consummate artistry a one-hour concert of carefully selected gems covering a wide range of materials in Telugu and Sanskrit by the greatest classical Karnatak composers. Completing the trio are the esteemed accompanists Padma Bhushan T. N. Krishnan, violin, and Padma Sri Umayalpuram Sivaraman, mridangam. Amy Catlin-Jairazbhoy’s research, writing, teaching, curatorial activities, and multi-media publications often have an applied focus, aimed at community development of minority traditions, especially in diasporic settings. She served as curator and presented the first concert and lecture tour outside India with a group of African-Indian Sidi performers from Gujarat, in September 2002, traveling with them in England and Wales. Her recent publications include Sidi Sufis: African Indian Mystics of Gujarat(Aspara Media 2002: 79-minute CD), the volume co-edited with Indian Ocean historian Edward Alpers, Sidis and Scholars: Essays on African Indians (New Delhi: Rainbow Publications and New Jersey: Africa World Press, 2003) and the DVD, The Sidi Malunga Project (2004). Funding for her research has come from such agencies as NEA, NEH, the Wenner-Gren Foundation for Anthropological Research, the American Philosophical Society, Fulbright, the Indo-US Subcommission, and the American Institute of Indian Studies. Her most recent publication is the DVD, Music for a Goddess, a continuing applied ethnomusicology project concerning Dalit (formerly known as Untouchable) Devidasis (women musicians dedicated to the Goddess) of the Deccan (India’s central plateau, where the most severe rural poverty reigns in many regions).